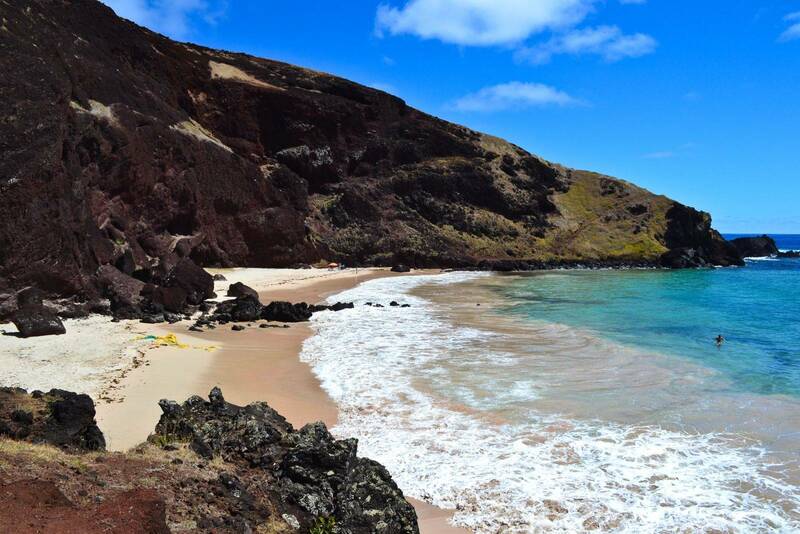 Discover the secret spots that Rapa Nui has to offer on the Hidden Treasures of Easter Island tour. This excursion looks to visit many of the hidden and often missed sites of interest on the island that are difficult to find without a guide, and is a fantastic complement to the Moai Monuments and Historic Pathways Tours. All of the sites on the tour are located a short walking distance from the vehicle, making it an ideal third day of exploration for those who are unable to manage a day hike. Hanga Kio'e/Ahu Akapu – Located north of the Tahai complex, the lone moai of Ahu Akapu was restored in 1972. Hanga Piko/Ahu Riata – The island’s main harbour and site of Ahu Riata, the last ahu to be restored back in 1999. Fundo Vaitea – The site of the ruins of the Williamson Balfour Sheep Ranch that leased most of the island for over 60 years. Ovahe Beach – A brilliant spot for morning photography, Ovahe beach is a postcard-sized white sand beach encompassed with a high wall of red scoria cliffs. Ahu Hekiʻi – One of the largest and most impressive ahu on the island, located close to the harbour settlement of Hanga Ho'onu. Pū o Hiro – A large boulder that can be blown as a trumpet, with a sound that is said to attract fish to the land. Ahu Hanga Te Tenga – The site of the largest moai to reach its ahu, the moai at Hanga Te Tenga met its demise when falling headlong as it was being erected. Vaihū/Ahu Hanga Teʻe – A small harbour and location of a re-construction of a traditional Rapanui settlement and home to a large ahu with eight collapsed moai, sitting as they have been since they were overturned hundreds of years ago. Ahu Huri a Urenga – Unique for being the only moai to have two pairs of hands, Ahu Huri a Urenga has an astronomical function, facing both to the the rising point of the asterism “Matariki” (Pleiades), and the rising point of the sun on the winter solstice. Ahu Akava – Just like the nearby Ahu Huri a Urenga, Ahu Akava also has an astronomical function, facing both to the the setting point of the asterism “Matariki” (Pleiades), and the setting point of the sun on the winter solstice. This moai is also unique for having one hand noticeably bigger than the other.